On August 9, 2018, at approximately 9 a.m., the Clark County Sheriff's Office Vice & Organized Crime Unit executed a Search Warrant at 357 Lincoln Park Circle, which stemmed from an investigation into suspected drug activities at that address. Entry was made into the residence without injury to occupants or law enforcement agents. The residents of the address, Equan Anderson, 31, and Asia Renee Powell, 25, were taken into custody by the Sheriff's Office at the scene and transported to headquarters for questioning by Vice & Organized Crime Unit agents. As a result of the search, a substantial quantity of suspected fentanyl and drug trafficking equipment and materials were seized, and two minor children were also found to be residing in the home, with direct contact with illegal drugs and drug trafficking activities. As a result of the investigation and the execution of the search warrant, both Equan Anderson and Asia Powell were incarcerated in the Clark County Jail, and will be arraigned on charges of Trafficking in Drugs, Possession of Drugs, Permitting Drug Abuse, and multiple felony counts of Endangering Children at 10:30 a.m. on Friday, August 10, 2018, at the Clark County Municipal Court. On January 24, 2018 the Clark County Sheriff's Office executed two separate narcotic search warrants at two locations based on complaints of suspected drug activity reported in the county. The address of the search warrants were 807 West Washington Street and 1001 Langdale Avenue in the City of New Carlisle. After receiving numerous complaints, in regards to possible drug activity at these residences an investigation ensued with the request for a search warrant, and the execution of the search warrant was completed on this date. Upon executing the search warrant, investigators recovered evidence of drug paraphernalia, and various items that will be investigated with additional charges pending. Two individuals, Christine Howard and Michael Fulwiler were located in the residence and have been charged and booked into the Clark County Jail. Christine Howard was charged with Obstructing Justice due to her actions on scene and Michael Fulwiler was charged with Obstructing Justice, Resisting Arrest, and Drug Paraphernalia. They will appear in court on Thursday, January 25, 2018. Upon executing the search warrant, investigators recovered evidence of drug paraphernalia, prescription medication, methamphetamine, and other evidence of trafficking in drugs. Three individuals, Clayton Allen, Patricia Brown, and Darrell Brown were located in the residence and have been charged. Clayton Allen was charged with Trafficking in Drugs and Possession of Drugs and currently is booked into the Clark County Jail and will appear in court on Thursday, January 25, 2018. Patricia Brown was charged with Trafficking in Drugs and Permitting Drug Abuse. Darrell Brown was charged with one count of Permitting Drug Abuse. Both were ordered into court on Thursday, January 25, 2018. The Clark County Sheriff's Office has conducted a fundraiser for Special Olympics, in honor of our fallen sister, Deputy Suzanne Waughtel Hopper, who gave her life in the line of duty on January 1, 2011. Deputy Hopper was a staunch supporter of Special Olympics, and gave her time and her finances to support this worthy cause. To continue our participation in raising money for the Special Olympics program, the Clark County Sheriff's Office announces the "Furry February" Fundraiser for our personnel. For a substantial donation, both sworn and civilian members of the Clark County Sheriff's Office gain the privilege of modified grooming standards for the month of February. Citizens may see deputies and other staff with beards, no ties, or sporting Sheriff's Office ball caps instead of the standard uniform headwear. Civilian and non-uniformed staff may also be seen in more casual professional attire. We would like the public to take note when they see these personnel, and reflect on our support for the Special Olympics program. Sheriff Burchett and her staff would also like to issue a challenge to other offices of city and county government to join us with fundraising programs of their own for the benefit of Special Olympics, to see who can raise the most for this program that means so much to so many. On March 23, 2018 a Clark County Grand Jury returned a no bill on Deputy Jake Shaw regarding the officer involved shooting that occurred in New Carlisle on September 4, 2017. The Sheriff's Office is grateful to the BCI investigators and other officials at the Attorney General's Office for conducting this investigation. The Sheriff's Office will now conduct an administrative review of this incident, but cannot comment further due to pending litigation. On the evening of May 30, 2018, the Clark County Sheriff's Office was notified of a possible phone scam where the individuals were representing themselves as the Sheriff and Deputies of the Clark County Sheriff's Office. The person receiving the call is greeted by a male subject that identifies himself and Sheriff (Random Name) of the Clark County Sheriff's Office. This person then tries to solicit cash donations for the department. Investigators have looked into this and have discovered that the phone number the call is originating from, (937)-540-0041, is a spoofed number out of Belgium. The Clark County Sheriff's Office would like to warn the public of this scam and make sure that they are aware that at no time will the Clark County Sheriff's Office make calls to solicit donations. If you receive a call from any individual requesting a donation for the Clark County Sheriff's Office, please do not give them any personal information or any bank account information and contact the real Clark County Sheriff's Office at (937)-328-2560. 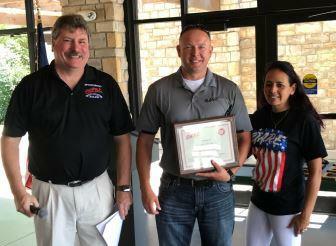 Deputy Josh Berner received an award for 5 years of dedication to the DARE program on June 24, 2018. Pictured with Deputy Berner are DARE Committee Co-Chairs, Sergeant Don Wilson (Springboro P.D.) & Officer Joann Felton (Solon P.D.) .